Mr Hamilton was speaking as a new television documentary, the third to be broadcast in less than three weeks, further increased pressure for the British state to tell the truth on its murderous collusion with hundreds of informers and state agents. Hamilton said he would consider allowing the proposed Historical Investigations Unit (HIU) to look at the material, which he said contained “millions of documents”, but that some information would have to be legally suppressed “to protect lives and to protect people’s privacy”. He said that if the vault is opened, “out of that will pour material that will present challenges for other people in the system”. “I don’t think we should be exempt from scrutiny from investigation in the police service, past or present. I think that’s good... but I actually think other people have stories to tell and questions to answer,” Hamilton told journalists ahead of the broadcast. He feared the records, including plans for covert operations and minutes of meetings, meant that there would be an excessive focus on the role of the RUC/PSNI police in atrocities. Hamilton was speaking ahead of a documentary by Irish state broadcaster, RTE, to be aired next Monday, which will allege that collusion between the Crown forces and loyalist paramilitaries went right to the top of the British government, with former Prime Minister Margaret Thatcher turning a blind eye to it. The programme points out that the Crown forces concentrated their efforts on “destroying” the Provisional IRA, at the same time as publicly stating that it was dealing with the conflict in an even-handed way. Such was the extent of collusion with loyalists in the 1980s that a RUC Special Branchman tipped off a top-level UDA paramilitary ‘brigadier’ about the presence of an informer in the organisation. The programme includes a statement by a former member of the RUC/PSNI Special Branch, that when he raised the issue of the use of informers and agents with government authorities, the message he received from the Thatcher administration in London was “carry on - just don’t get caught”. Former PSNI Chief Hugh Orde also told documentary marker John Ware that the former head of the British Army’s secret Force Research Unit (FRU), Gordon Kerr, should have been put on trial over collusion -- without admitting any complicity of his own. Former Police Ombudsman Nuala O’Loan tells the same programme that she was pressured to drop her investigations into PSNI collusion after Orde became PSNI chief in 2002. 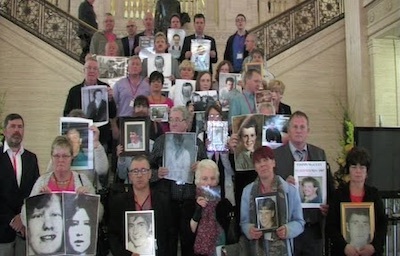 Mark Thompson, director of Relatives for Justice, said there was no longer any doubt that collusion was formally approved by the British government. He said the ‘Kitsonian doctrine’, or the ‘dirty war’ of low intensity operations put in place in the early 70s by British Army brigadier Frank Kitson, had “framed the entire conflict”. He said a “firewall of protection” existed through unwritten rules and guidelines that would otherwise create a trail of responsibility to the door of No. 10 Downing Street. “In meetings with the most senior government, military and police officials, one imagines, no one specifically identifies a particular person and says “go and kill’ or “take out that person”, especially meetings and briefings involving a prime minister,” he said. “It’s rather more discreet; a convenient framework policy is intentionally adopted that enables and facilitates practices that have the exact same desired end result. “This is as effective as having named and pointed a finger at a particular individual to be targeted and killed.